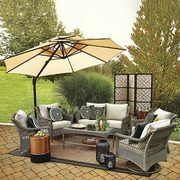 Update your patio for this spring and summer at Lowe's and save up to $500 on select furniture and more until April 17. Offer is available until April 17. Free parcel shipping is available on qualifying orders $49+. Quantities are limited so shop now while supplies last.